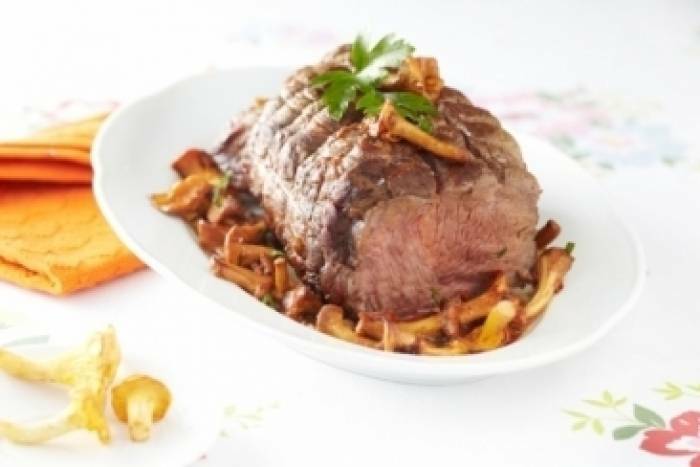 Roasted veal cooked with white wine and veal stock, served with fresh girolle mushrooms. Peel and finely dice the shallots. Crush the garlic cloves with the side of a kitchen knife. In a hot pan with a drizzle of olive oil, brown the veal for 2 minutes on each side. Add the shallots, thyme and crushed garlic cloves then season with salt and cook for 2 minutes. Deglaze the pan with white wine and reduce by half. Add the veal glaze then cover and simmer for 1 hour. Pick and chop the parsley leaves. Wash and thoroughly dry the mushrooms. Heat a frying pan, add olive oil and then cook the mushrooms over a high heat. This may have to be done in small batches depending on the size of your pan. Add the butter and parsley to the mushrooms and season with salt and pepper. Once the veal joint roast is cooked, add the mushrooms to the same pan, cover and cook for a final 5 minutes. Remove the meat from the pan and remove the string. Carve the meat and serve with the mushrooms.